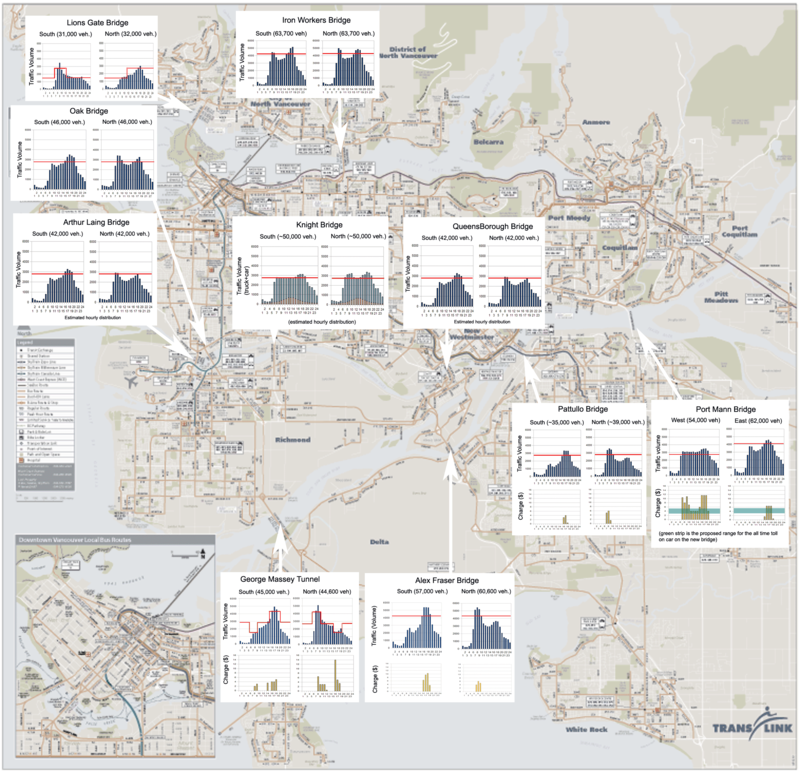 For purpose of illustration, below is a map overlaid with the traffic volume on the main bridges of the Vancouver area. They come from the thesis of Peter Wightman , which is the most complete work I have uncovered on the topic applied on the Vancouver area, but still limited on the Fraser crossing bridges. For information, below are the estimated revenue of congestion pricing, in the case of all bridge crossing the Fraser tolled (this assuming the 2006 situation, and a relatively low elasticity of -0.2 peak, and -0.25 off peak period) according to . It is worth to note that congestion pricing could apply only when bridge reach capacity. At the exception of the Port Mann bridge West bound, that is an average of only 4 hours per bridge (or put in other way, crossing a bridge could be free 20hours per day),… but still generating close to 200 millions of annual revenue only on the bridge crossing the Fraser river. it is also worth to notice that under a congestion pricing scheme as proposed by , the Port Mann bridge toll could have been lower than the one considered by the province (in green on the map above) most of the time…and the Pattullo bridge needs to be tolled less than 3hrs per day (per direction). Estimating Commuter Mode choice: A discrete choice Analysis impact of road pricing and parking charge, Washbrook, Haider and Jaccard, Transportation, 2006. Toll for new Port Mann Bridge will be $5.15 for casual users, Damian Inwood, The province, June 2010.